As a French girl, it’s probably not surprising how ignorant I am about American football. My husband Lulu has tried several times to teach me the rules, and failed miserably. I'm trying hard, I promise! At the very least, I can participate in the fun by whipping up some delicious snacks to enjoy during the game. Today, I made batches of sugar cookies using the colors of both teams. I used black and yellow for the Steelers and green and yellow for the Packers. The black, yellow and green cookie doughs were respectively flavored with semi-sweet chocolate, Meyer lemon and pandan paste. I remember a few years back that the Steelers were participating in the Superbowl as well, so they must be a good team. 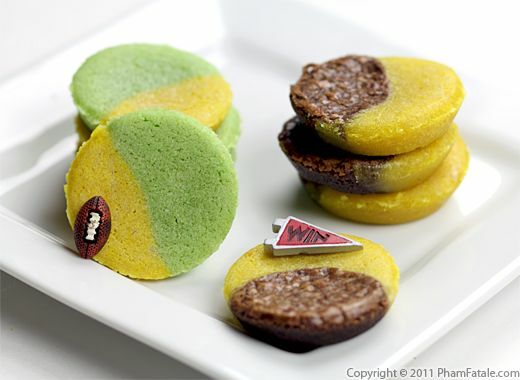 Lulu's rooting for them, but with these cookies you can represent yourself no matter which team you're cheering for. I’m also going to post a list or two this afternoon of other tasty treats that you can serve at your Superbowl party, so stay tuned for that. I hope you enjoy the food and the company this Sunday! 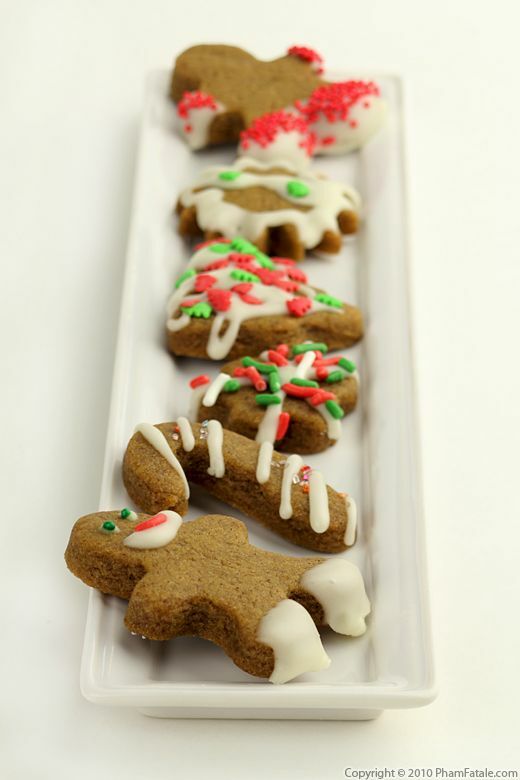 I used gingerbread cookies as a fun and playful way to get to know my niece and nephew when I met them for the first time. 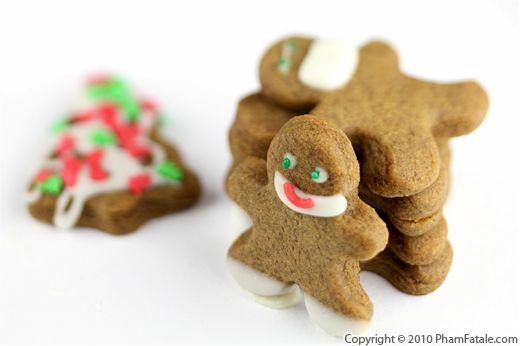 I baked a few gingerbread men for them, and asked them what they thought of the designs. My little nephew is just a year old, so I didn't use any egg in the gingerbread dough. We're finally back from a few days in Rome and now are spending Christmas with my parents and my sister's family in Paris. Our family loves oatmeal cookies. They are great on their own or with tea, which we consume in large quantities. Oatmeal cookies also make a great palette for other flavors. 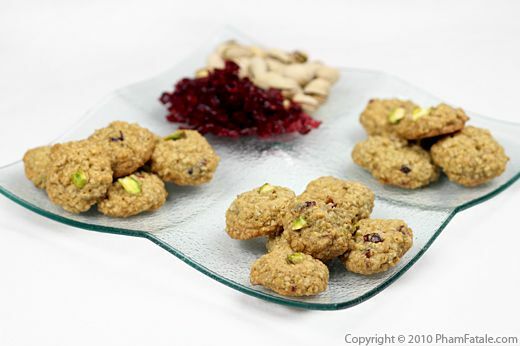 This time around, I flavored the cookies with dried cranberries and pistachios. You could also blend other flavorings such as raisins, pear glacé, dried mango, dried cherries or dried apricots and other nuts. During the holiday season, I like to serve them with eggnog or soynog. This recipe gives “finger food” a whole new meaning. My 1st-grader sister-in-law is going to participate in the Halloween parade at her school, and I thought it would be fun to bring some scary treats to share with her classmates. After deliberating with the munchkin, we decided to make finger-shaped cookies. To start, I made the first batch of cookie dough with a few drops of pandan extract to give the cookies a green color. My munchkin helped me out shaping the fingers but we realized they were shaped way too big as they expanded after baking. I exclaimed: "Those are Shrek's fingers!" to which my little one responded: "Why would you chop off Shrek’s fingers?!?!". After calming her down, we settled on calling them “witch” fingers. I made the second batch much smaller with less pandan to make it more realistically like a witch's skin (I'm just guessing since I've personally never met one). 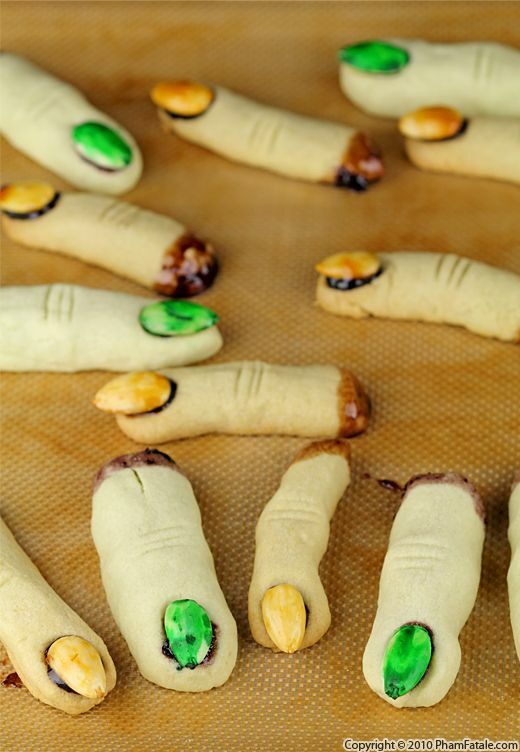 The fingernails are made of candied blanched almonds and the fingers are dipped in fruit preserves to imitate blood. 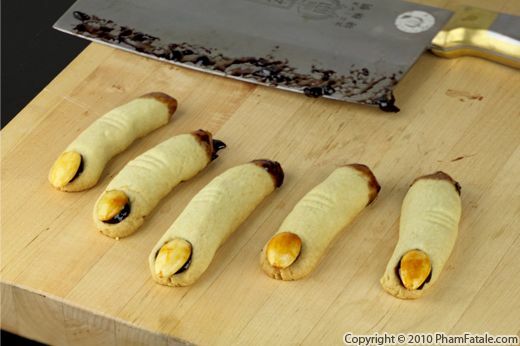 The finger cookies look very realistic, so I don't know if they're appropriate for 6-year-olds. I’ll tell you tomorrow what the reaction was. Family friends from Hyderabad (India) came to visit us last weekend. They brought with them delicious specialties from Lulu's father's hometown. They're called "fruit biscuits". 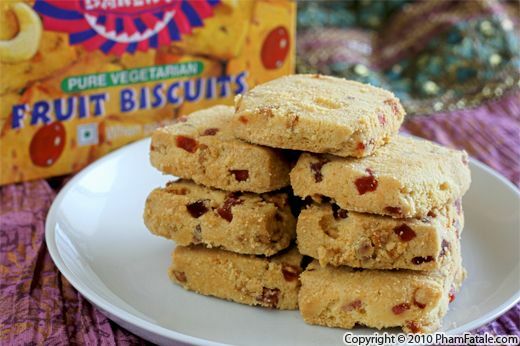 The texture is crumbly, just like a shortbread cookie with a strong rose flavor and a variety of dried fruits. Page 6 of 14 pages.